But buying a home with a price tag of more than $3 million can prove to be a bit trickier than navigating the run-of-the-mill real estate market. There are pre-approval letters, specialized luxury brokers, and the ordeal of proving you're a legitimate buyer. Check out the market online to get an idea of what you do and do not want. Gonnella Realty gets the majority of their business through the Internet. 2. Get a qualified broker. Find the broker who is doing the most sales in luxury real estate in your desired location. Then, let him find houses for you and show you the best value in town. 3. Get a pre-approval record. "Everyone should have a pre-approval letter," Arlene said. A letter from the bank doesn't ensure you'll be approved for a mortgage, but it puts the seller's mind at ease if he take his home off the market to go under contract with you. 4. Be ready to divulge details about yourself. The Gonnellas said they ask a few appropriate questions about what someone does for a living, and other assets they have that would help qualify them to purchase a luxury home. Some sellers require a letter from an accountant and a bank statement to show that a potential buyer is qualified to purchase their home and as a proof of down payment. Interest rates are still very good, Chris Gonnella said. Paying cash would be an inefficient way to use your money. Most Expensive Homes in All 50 States -- and D.C.
Every state has its fair share of luxury homes, but just what top-of-the-line really means to the local market varies dramatically. This week's gallery drives that point home. Feast your eyes on the most expensive home in each state, drawn from our listings database. California's most expensive home, for example, costs $125 million -- in fact, the mega-mansion claimed the mantle of priciest home in our entire database. But South Dakota's winner, by contrast, doesn't even break the $1 million mark. Click through our gallery to see the homes that top the charts in all 50 states -- plus D.C., of course. This behemoth of a residence has a double-digit number of bedrooms and bathrooms harbored by 50,000 square feet of space that gleam with exquisite details. Outside, dotting its manicured 28 acres are two cabana homes along with a barn, guest house and riding ring. Venture inside to find elaborate finishes, and, among other features, a 25-seat movie theater. Pass the gourmet popcorn. See the listing for more details. See more homes for sale in Birmingham, Ala.
Alaska's most expensive home clocks in just shy of $4 million on the price meter. The gated property features a four-car garage, hot tub and swimming pool. Highlights of the 9,000-square-foot home include a theater and elevator, and an intercom system so family members can find each other in the sprawling interior. See the listing for more details. See more homes for sale in Anchorage, Alaska. Stretching 40 acres, this property perches on Paradise's Valley's Mummy Mountain. The home has soaring ceilings, floor-to-ceiling windows, and among a wide array of other striking features, "telescoping doors," -- whatever those are. See the listing for more details. See more homes for sale in Paradise Valley, Ariz. The most Arkansas could muster in the way of over-the-top expensive homes was this 9,742-square-foot stone mansion. But it's plenty luxurious, despite being on the low end of the properties featured in our gallery. The handsome digs offer a swimming pool, home theater, game room, office and gym. See the listing for more details. See more homes for sale in Little Rock, Ark. The Golden State managed to field the most expensive home in AOL Real Estate's database, smashing through the 1/10 of a $1 billion barrier to hit $125 million on the price scale. Guarded by a network of flower-adorned hedges, the home is a straight-up palace, so big we don't even know how many square feet it contains. See the listing for more details. See more homes for sale in Los Angeles, Calif.
A world-class mountain estate, this residence lays claim to two acres of coveted Aspen dirt. The uber-lodge is marketed as the "perfect second home for your most discerning buyer." We might add that, in addition to being "discerning," you also need a spare $20 million. See the listing for more details. See more homes for sale in Aspen, Colo.
No shortage of tree-obscured mega-mansions in leafy hedge fund-saturated Greenwich. No sir. Witness the cream of the crop: a 75-acre property -- "one of the last great estates of Greenwich," the listing states -- that includes a great hall with 40-foot ceilings. The expansive acreage also includes a fiefdom of staff houses. 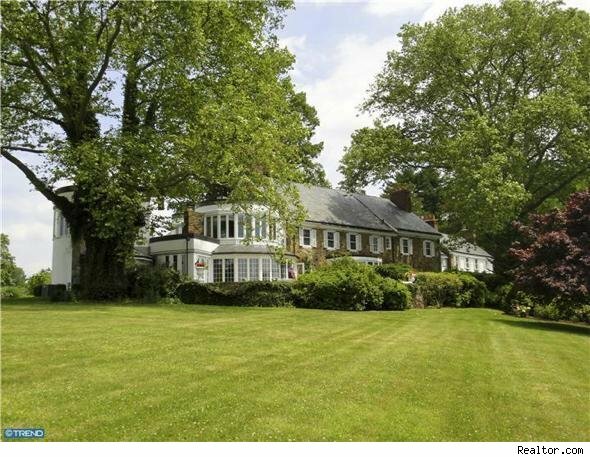 See the listing for more details, or see more homes for sale in Greenwich, Conn.
Overlooking Battery Kemble Park, the this elegant dwelling boasts its own honest-to-goodness ballroom -- the perfect gathering place for visiting diplomats and dignitaries. Other amenities include a pool, guest house, library and dining room that seats 18 people. See the listing for more details. See more homes for sale in Washington, D. C.
Delaware's residential pride and joy may be this $7.5 million beachfront property. Beyond its elaborate interior and sweeping ocean views, the home has access to boat facilities, tennis courts and a pool. See the listing for more details, or see other homes for sale in Rehoboth Beach, Del. The most expensive house on "Billionaires' Row," this mega-mansion shamelessly pursues a level of extravagance matched only by its inspiration: Versailles. The property sits on what used to be an entire street, has 250 feet of waterfront and, with parking space for 50 cars, begs for the opportunity to host blow-out parties. See the listing for more details, or see other homes for sale in Palm Beach, Fla.
Name a luxury amenity, and this "palatial masterpiece" has got it. Sweeping grand staircases, acres of granite, gilded coffered ceilings, columned loggias, an outdoor kitchen. Just the place to whip up some snacks to enjoy by the pool and hot tub in the lavishly tiled central courtyard. See the listing for more details, or see other homes for sale in Atlanta, Ga. If you throw down the $55 million for this property, you're definitely not paying for the charming if modest house pictured here. You're paying for 4,500 acres of pristine Hawaiian real estate. We're talking three miles of coastal dirt. Currently the territory serves as a ranch for 1,000 cattle. See the listing for more details, or see other homes for sale in Hana, Hawaii. This 35+ acre estate has its own pond, woodlands, lush gardens and sunset vistas. The outdoor enthusiast will love the fishing, hiking, walking trails, and hunting. And if you like rocks, you'll love the main house: It's made of solid limestone, and has marble and granite flooring. Better yet, the price includes most of the furnishings. See the complete listing here, or see other homes for sale in Springville, Iowa. For just under $20 million, you can own this massive 1,444-acre waterfront property. It has 3.5 miles of creek and 3.5 miles of river, a pond, and a private wildlife preserve, perfect for trout fishing and waterfowl hunting. In addition to the 4-bedroom main home, the property also includes a 3-bedroom log home. See the listing for more details, or see other homes for sale in Carey, Idaho. This place is so upscale that you need verified financial references just to see additional photos. It's no surprise, this mega-mansion sits on seven gated acres. It comes with top-of-the line appointments, has luxurious entertaining areas, and even its own basketball court! See the listing for more details, or see other homes for sale in Highland Park, Ill. This estate on five acres is built for entertainment, with multiple wet bars, a home theater, and a game room. Enjoy the outdoors from multilevel decks, a resort-style pool and waterfront, and professionally landscaped grounds. The master suite has a private sitting room and two walk-in closets. See the listing for more details, or see other homes for sale in Fishers, Ind. This country French estate is elegant, to say the least. It's also long on character, with a reclaimed Italian stone porch, an antique fountain, woodburning fireplaces, and vintage light fixtures throughout. Then there's the kitchen, equipped with a six-burner Wolf stove, double ovens, two dishwashers, and a Subzero refrigerator. Add in a workout room, salt-water pool, outdoor patios, and a four-car garage, and this place has everything anyone could ever want--in Kansas. See the listing for more details, or see other homes for sale in Wichita, Kan. Featured in Architectural Digest, this 299-acre horse farm comes with paddocks, a training/breeding facility, and a lighted arena. Inside, it's got a contemporary flair, with walls of glass through which to enjoy the view of your equestrian empire. See the listing for more details, or see other homes for sale in Louisville, Ky.
One of the largest of the antebellum Bayou sugarcane plantations, this 1846 house built by noted New Orleans architect Henry Howard has been completely restored. It features a ballroom, an elaborate fireplace, a 9-foot stained glass transom, sits on 10 acres, and is listed on the National Register of Historic Places. See the listing for more details, or see other homes for sale in Donaldsonville, La. Sitting on one of the most exceptional sweeps of land on the East Coast, this 26-plus acre estate on Cape Cod's private Oyster Harbors island offers almost 1,000 ft. of shorefront, a beach house, a detached loft studio, classic greenhouses, a tennis court, expansive lawns, and orchards. See the listing for more details, or see other homes for sale in Osterville, Mass. Not your average residential leviathan, the enormous main house sits on an approximately 6,250-acre estate. The property also features an indoor horse riding ring, an indoor tennis/sports center, two guest houses, multiple barns and kennels. See the listing for more details, or see other homes for sale in Cambridge, Md. As quaint as an 11,700 ft. mansion can get, this house sits on 54 acres of oceanfront property. It fully takes advantage of its location with a beach, dock and moorings. The main house provides amazing panoramic views of the water, while the two guesthouses come complete with exquisite finishes and details. See the listing for more details, or see other homes for sale in Deer Isle, Maine. This home, nicknamed "the Charlevoix Cottage," was featued on HGTV's "Amazing Waterfront Homes" in 2008. It offers 227 feet of sandy white beach, a lighted tennis court, a screened gazebo, a massive 20-person spa, a home gym, a wine room, and a putting green. See the listing for more details, or see other homes for sale in Charlevoix, Mich.
Not far from downtown Minneapolis is this lakefront home with almost 360-degree water views. The 13-acre estate has a pool and spa, a tennis court, and plenty of yard space. The main house also features an indoor pool in its exercise room. See the listing for more details, or see other homes for sale in Orono, Minn. This 23.5 acre estate is a former Anheuser-Busch corporate retreat. It sits on two peninsulas jutting into the Lake of the Ozarks and has four furnished houses. It also features a helipad, a clay tennis court, a swimming pool, a boat dock, and a large garage with a health facility for keeping beer guts in check. See the listing for more details, or see other homes for sale in Camden, Mo. This luxurious mansion features a stunning central courtyard filled with lush palm trees, as well as a pool and gazebo on the grounds of its 8.5-acre lot. See the listing for more details, or see other homes for sale in Pass Christian, Miss. This sprawling estate, called Swift Eagle, features a rustic log cabin-style residence sitting on the shores of Whitefish Lake. The 35-acre lot offers ponds, creeks, a meadow and mountain views. See the listing for more details, or see other homes for sale in Whitefish, Mont. This property, known as Burt Farm, features a lovingly restored historic main house on an enormous lot of more than 121 acres. Also included are a guesthouse, caretaker’s home, cabin, barn, tennis court and putting green. See the listing for more details, or see other homes for sale in Cashiers, N.C. This three-story brick-and-wood beauty dates back to 1883. It features custom hardwood floors on the inside and a bold Victorian color palette on the exterior. See the listing for more details, or see other homes for sale in Fargo, N.D. This elegant, column-accented waterfront mansion has soaring ceilings and majestic staircases leading up to its wings. The master suite offers panoramic views, a private terrace and a spa bathroom. See the listing for more details, or see other homes for sale in Bennington, Neb. This waterfront estate boasts spectacular views and features a fabulous children’s wing. Amenities include a library, conservatory, hobby room, spa, home theater, and computerized golf course. The grounds – nearly three acres – offer beautiful landscaping, as well as a gazebo, putting green, and three-room carriage home. Scenic Lake Winnipesaukee is just steps away. See the listing for more details, or see other homes for sale in Gilford, N.H. Sitting on a lush lot of six acres, this mansion comes complete with swimming pool and tennis court. Among its features are an indoor basketball court and a home theater with stadium seating. Fine woodwork and marble throughout. This fine estate overlooks Sante Fe from the hills of the Sande de Cristo Mountains. Situated on an expansive lot of 36 acres, it features both horse and golf facilities, as well as pool surrounded by ruggedly beautiful hardscape. This exquisite residence, known as Tranquility, is Lake Tahoe’s most over-the-top estate, with 210 acres as its backyard. The property includes eight buildings: main residence, conservatory, guest residence, art studio, boathouse pavilion, gymnasium with indoor basketball court, stable, and additional residence for guest and the requisite staff. Location: New York, N. Y. Talk about old luxury in New York. This five-story neo-French Renaissance mansion was built in 1916. So what do you get for $90 million? For starters, the dining room has enough space for 50 people. The kitchen also has ample seating and a dumbwaiter to the service kitchen below. The third floor has a large wood-paneled library and a wet bar. The fourth floor houses the master suite, which comes with two sitting rooms, two full baths, and two dressing rooms. And finally, the top floor has two more bedrooms with full baths, and a gym, capped with a stained glass skylight. See the listing for more details, or see other homes for sale in New York, N.Y. This mega-estate's 160 acres includes a marina, 2,300 feet of lake Eerie waterfront and beachfront, a heliport, and is surrounded by waterfall fountains, ponds, and excavated hills. Anyone so rich should never have to back out of a driveway, so the two-car garage has a custom rotating floor. There's another rotating floor in the dining room, so no dinner guest is deprived of a view of the water. See the listing for more details. See more homes for sale in Vermilion, Ohio. The Santa Fe style house sits on a 2,200-acre ranch. The ranch boasts several corrals, pens, barns, workshops, ponds, lakes, and an additional four-bedroom brick house for guests or ranch hands. Included in the price is a 50 percent interest in the minerals located on the property. See the listing for more details. See more homes for sale in Morris, Okla. This Northwest ranch includes 735 irrigated acres, with two houses, shops, barns, cropland, and a feedlot big enough for 3,120 animals. Also a whole lotta open sky. See the listing for more details. See more homes for sale in Joseph, Ore. This modern house, designed by Rafael Viñoly, includes a library, a gourmet eat-in-kitchen, a media room, offices, and a play room. The 70-acre property also includes indoor and outdoor tennis courts, a 4,000-bottle wine cellar, a pool, a pool house, and two stone farmhouses. All just 22 miles from downtown Philadelphia. See the listing for more details. See more homes for sale in Fort Washington, Pa. This classical Palladian style home was designed by Horace Trumbauer in 1904. Perched on seven acres directly overlooking the Atlantic Ocean, the property also includes a 10,000-sq.-ft. carriage house and stable complex. See the listing for more details. See more homes for sale in Newport, R. I. This fine Federal style home has been painstakingly renovated over the last several years. Some of the updated features: a ballroom, a fitness room, a wine cellar, a butler’s and maid’s quarters, and a carriage house featuring a full guest apartment. See the listing for more details. See more homes for sale in Charleston, S. C.
A Robb Report "Exceptional Home," this house showcases views of the exquisite natural landscapes on its surrounding 5.8 acres. It features a hotel-size indoor heated pool, European-influenced gardens, and a treehouse in the encircling private woods. See the listing for more details. See more homes for sale in Brandon, S. D.
Sited on 20 acres, this grand manse has a stocked pond for fishing and a pool house with a kitchen and bathroom. The main house is dripping with chandeliers, hand-painted murals, and other befittingly fancy touches. See the listing for more details. See more homes for sale in Knoxville, Tenn.
Just a hair under $28 million gets you more than 3,000 riverfront acres, just 45 minutes from Forth Worth. See the listing for more details. See more homes for sale in Mineral Wells, Texas. Presiding over five acres of lushly landscaped grounds, this Georgian Colonial recalls Virginia's plantation era. Perched on massive rocks, this estate sprawls over 15 acres of prime Northeast ski country. The home features an enormous marble atrium, indoor pool and media room for a little apres-ski entertainment. Offering 164 feet of waterfront, this home features not one but two covered barbecue areas, both overlooking an expansive pool. The home has a theater, "hobby room," and six-car garage, among other amenities. See the listing for more details, or see other homes for sale in Mercer Island, Wash.
Nestled in the midst of a verdant grove, and steps away from the sandy shore of Porcupine Bay, this perfectly private residence is exquisitely furnished and features an indoor pool. This scenic retreat is located inside the storied Greenbier Sporting Club, which hosts the PGA Tour’s Greenbrier Classic. Features include custom cabinetry and a gourmet kitchen with granite finishes. See the listing for more details, or see other homes for sale in White Sulphur Springs, W.V. This expansive gated estate is situated at the base of the Jackson Hole Mountain resort, on more than 10 acres. Finely furnished in an upscale rustic style, with beautiful gardens and pellucid streams. Amenities include home theater, two offices, professional gym, and 4000 bottle wine cellar. See the listing for more details, or see other homes for sale in Teton Village, Wyoming.